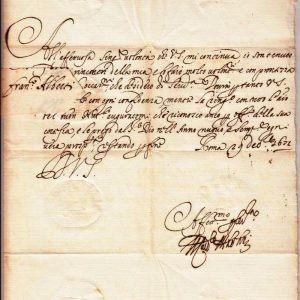 Fabio Chigi was born at Siena in 1599, the son of a distinguished family of bankers. Due to poor health that began in infancy he was educated primarily at home, first by his mother and subsequently by tutors. His love of learning was noted early on and he eventually earned doctorates in philosophy, law and theology at the University of Siena. In 1628, at the age of twenty-nine, he entered the papal service, serving first as vice-legate in Ferrara for five years. He then returned to Rome, was ordained a priest and shortly after was named a bishop. In 1635 he was named the inquisitor of Malta and from 1639 – 1651, nuncio in Cologne. 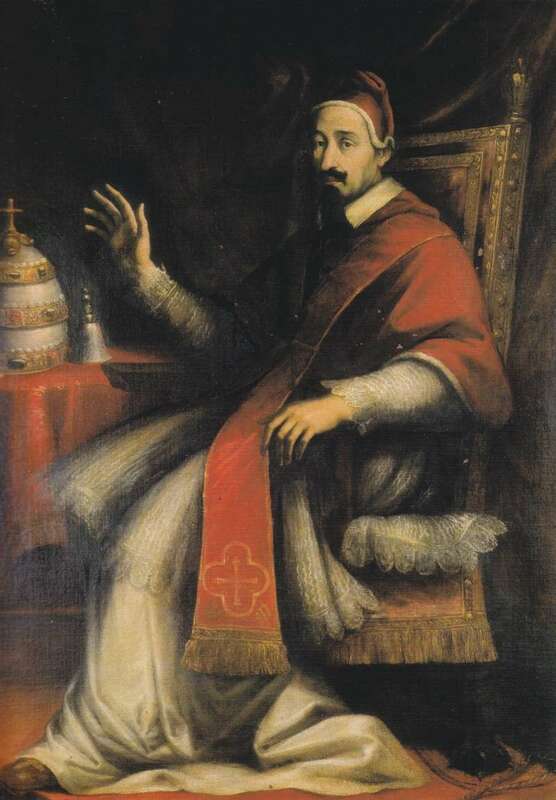 Although he was unable to orchestrate any successful negotiations for the Catholic Church, Pope Innocent was impressed with his work and recalled Chigi to Rome. elevated him to the rank of cardinal and made him his Secretary of State in 1651. That was followed by other appointments—as cardinal-priest of Santa Maria del Popolo and later, bishop of Imola. 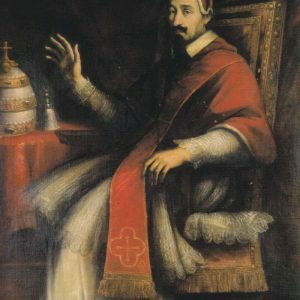 Pope Innocent X died in 1655. 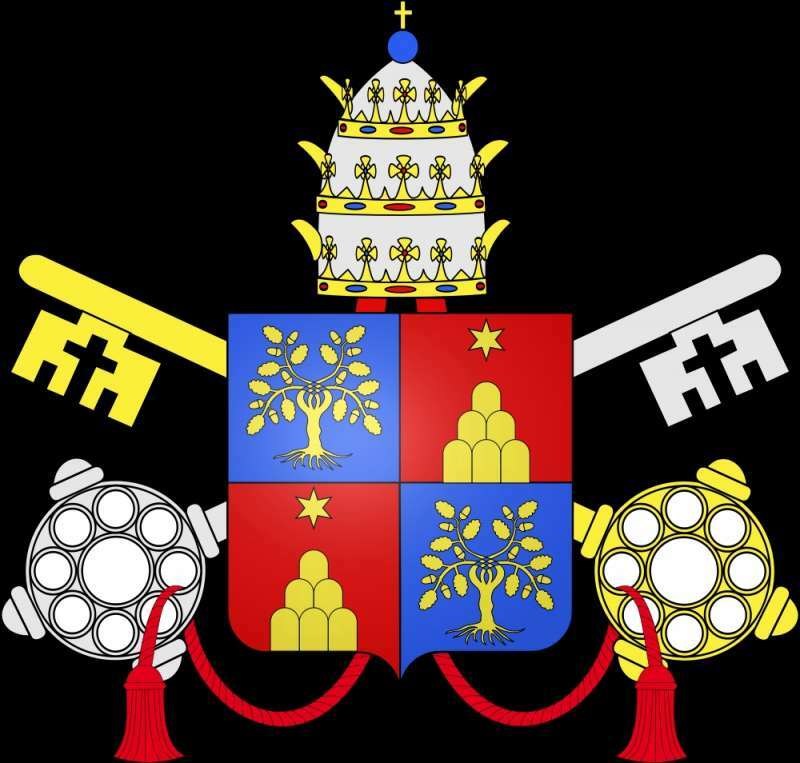 The conclave that elected Fabio Chigi deliberated for eighty days before naming him the new pontiff. The powerful French minister and cardinal, Jules Mazarin initially opposed him, but Chigi was the favored candidate of the Spanish. He took the name of Alexander VII. He was fifty-six years of age at the time of his election and would rule for twelve years. 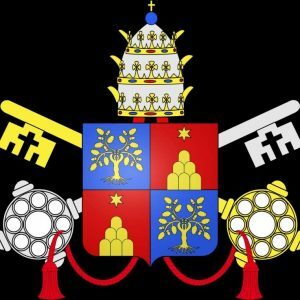 Although he personally was against nepotism, even going so far as refusing to allow his relatives in Rome for a year after he was elected, he soon succumbed to the pressure of the Curia itself who insisted his family should live in style. Shortly thereafter, he announced that his brother and nephews would be assisting him. He began heaping the best civil and ecclesiastical offices upon them, giving them princely palaces and estates and allowing them to govern the papal state. Alexander’s problems with Cardinal Mazarin, the adviser to Louis XIV of France continued to prove troublesome. Mazarin opposed Alexander during the negotiations that led to the Peace of Westphalia. He defended the Gallican Church(which refers to the French tradition of their independence from papal authority). He opposed Alexander’s election and orchestrated diplomatic havoc for the pope by appointing his personal enemies as ambassadors. In 1662, the hostile Duc de Crequi was made ambassador to Rome and precipitated a quarrel between France and the papacy resulting in Alexander’s temporary loss of Avignon and a humiliating treaty at Pisa. This was followed by a declaration insisted upon by King Louis that Pope Alexander state publicly that he had been right to condemn certain Jansenist propositions, and that all clergy had to accept the pope’s decision. Because of this, Alexander issued a bull in 1656 on the heretical nature of the Jansenist beliefs. Matters of state gave the pope little pleasure. He loved tranquility and delighted in patronizing the arts. 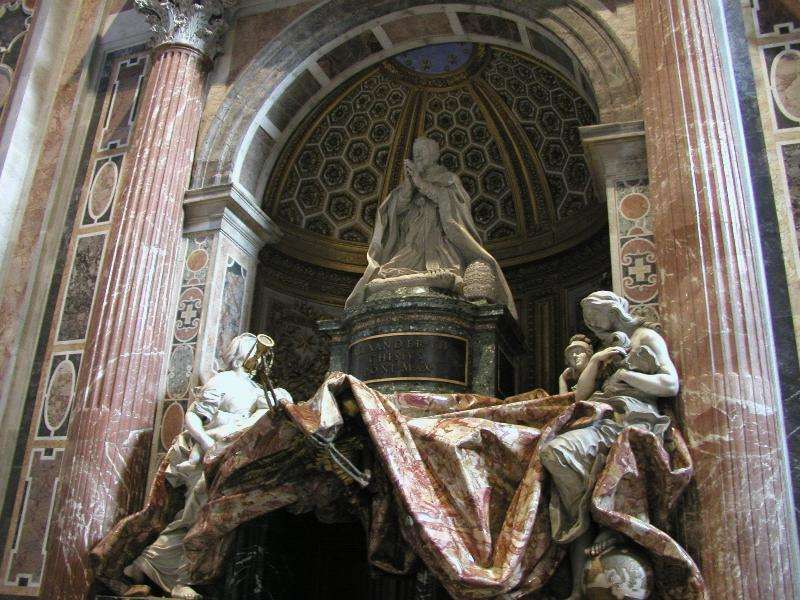 Bernini was employed both as a sculptor and architect. Bernini not only built the Scala Regia, leading to the Sistine Chapel, but also the immense colonnade of the piazza of St. Peter’s, his greatest architectural achievement, and the magnificent tomb of Alexander in St. Peter’s. 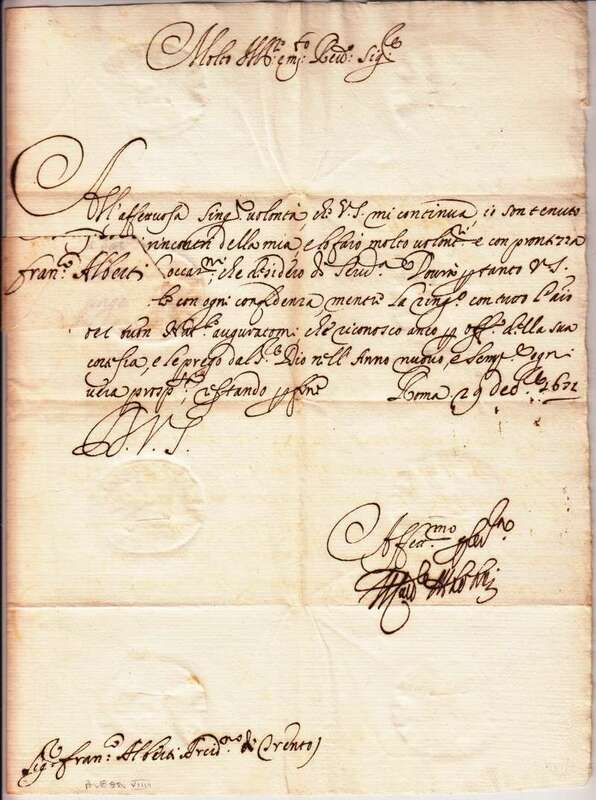 When Queen Christina abdicated the Swedish throne and converted to Catholicism, Alexander invited her to live in Rome. Initially, she charmed the pope and her home became an intellectual center. She was the center of Roman fashion and parties, queen of the social scene of the great Roman world. After the pre-Lenten Carnival of 1656, the pope regretted that he had invited her to Rome since there was such an atmosphere of immorality connected to the Carnival. The pope had hoped Christina would be an inspiration to others considering conversion. Instead her interests were mainly political, even to the point of intrigue when she plotted the conquest of Naples with Cardinal Mazarin. For a pope who loved his tranquility, Queen Christina provided little respite. Other political issues plagued Pope Alexander. There was the ongoing controversy between Spain and Portugal, the latter having declared its traditional independence in 1640. Spain refused to receive the pontiff’s nuncio and the Portuguese king left all the bishoprics unfilled since Alexander did not recognize him and would not accept the king’s recommendations to fill them. Meanwhile, in Venice, Alexander was able to persuade the city to permit the return of the Jesuits in 1656. They had been expelled during the pontificate of Paul V. In return for this favor, the pope provided financial and military aid against the Turks. When Emperor Ferdinand III died in 1657, Alexander supported Leopold I of Austria to rule the Holy Roman Empire. His reign continued for nearly fifty years. Alexander reveled in administrative work as a cardinal, but found it to be distasteful as pope. He delegated most of this work to the Congregation of State. He loved literature and had written volumes of poetry in his youth and daily meditated on the writings of Francis de Sales (1567 – 1622) whom he canonized in 1665. He wrote several small devotional works on Salesian piety anonymously. He delighted in the company of scholars and writers, enriched Rome’s University, Sapienza, bequeathing to it his own library, and helped the Vatican library to acquire a rich collection of the Dukes of Urbino. Alexander also wrote an authoritative document on the heliocentrism issue. He published anew the Index of Forbidden Books which Catholics were expected to adhere to. This index was not abolished entirely until 1966. Alexander’s reflections on the Immaculate Conception of the Blessed Virgin Mary were later utilized by Pius IX in 1870 when he issued his infallible definition making the Immaculate Conception Catholic doctrine. Pius IX cites Alexander VII’s work in a footnote of his own work. Alexander died in 1667 tortured by kidney stones, which were the cause of his death. He was sixty-eight years of age. 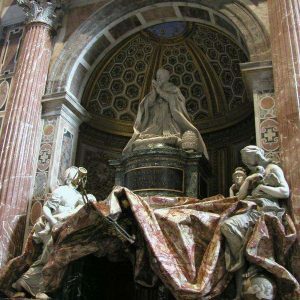 He is buried in the mausoleum created for him by Bernini.